coruscant – (adj) sparkling, gleaming; aglitter. This beauty of a word is from the 15th century, and I’m more than happy to bandy it about. I love sparkle and think our world is filled with it. For the most part though I’m not particularly drawn to over-the-top displays of glitter. More is not actually better in that department for me. I prefer the more subtle display that is just as coruscant, but is something that requires you to be present and paying attention. The sparkle is like a little cosmic reward – an unexpected treasure, and a true heart gift that delights. Frankly I think that’s a rather pessimistic view of things, and I whole-heartedly believe that “life’s enchanted cup” sparkles throughout. Furthermore, I think we need be careful how we hold and speak of things as it tends to solidify our position, often not in a helpful way. The true delight of sparkle for me is that it entirely depends on your perspective – a bit of light catches it this way, and then shifts and it’s gone. It’s such a vibrant invitation into staying open to flow, staying open to looking, staying open to letting your delight be captured. This winter I re-ignited my love affair with mica and all its coruscant magic. I think it began when I purchased this magical body oil from Herbivore, scented with rose and jasmine oils and shimmering with tiny bits of mica. I’ve often used mica flakes and sheets in my art, and I always have a stone or two that contains mica out somewhere where I can pick it and allow myself to be mesmerized a bit. 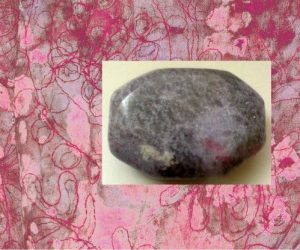 I’m particularly fond of aventurine, and at the start of every Spring I put out a favorite piece of rubellite-included lavender-colored lepidolite whose mica sparkles seem like the perfect harbingers of the magic that Spring unfolds. In Chinese medicine, mica is known as a sacred mirror, and I love contemplating this. Self-reflexivity and the ability to see ourselves as multi-faceted are important to me, and mica is a great ally in this. But all things that sparkle, all that hold coruscant properties are invitations. To remember that we can all hold and transmit light; that we can always alter our position so that we receive those flashes of light from others; that there truly is beauty all around us, we simply need to pay attention. Here’s what I know for sure: the world is filled with coruscant treasures that invite us into deeper awareness. All around us there is always magic and nuance, the bold and the only hinted at, all waiting to be recognized if we have the eyes to see. What’s glittering for you these days? What are you reflecting on? Do you think of Coruscant (alas, pronounced a bit differently) as a planet in the Star Wars universe? Do tell – you know I love to hear. 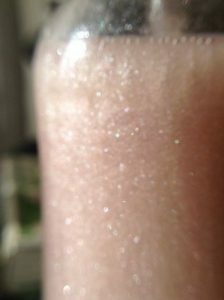 I use glitter lotion when I dance, a custom begun by a friend. So I think of her when I use it! Sounds like a double win-win Beth. I like the Chinese name for this substance. Sacred Mirror is descriptive and encouraging. What’s glittering for me these days? The kitchen sink! Years ago a wise person told me that when in doubt about what to do next, clean your kitchen sink. Hence, lately as I work through what to do next, our sink has been extra shiny. Ah a wise person indeed Ally. There’s something satisfying about tackling a finite space and seeing tangible results relatively quickly that just seems to ease the heart and mind. LOL – fair waraning Margaret for the giltteratzi to steer clear of your house. When I’m looking for something in my bathroom cupboard, I sometimes come across a very tiny pot of some kind of pale glitter blush. It’s not in your face at all – just a very light dusting of it but it does seem to brighten and lighten! The pot is so small that I miss seeing it most times, but when I find it and there’s an occasion to dust it lightly over my face, I use it – and like it. It catches the light and seems translucent – and makes me think of changing perspectives depending on how I look at it or myself ..
Lovely post on coruscant thank you Deborah! The ‘sound’ of it is quite mysterious too .. I often find that the invitations that you have to lean in close to hear lead you on the very best adventures. I suspect it’s because you’ve already started by opening your senses. LOL – most excellent point John. What a delightful image of La Luna! And yes, how fabulous to celebrate an elder’s still-bubbling cup. So much coruscant beauty in our world to deeply appreciate and marvel at. What a great word! Love sparkly things! Less is more, yes, I can totally resonate with that. I am not a bling-bling woman, but when the sky at night is full of stars…that’s a ‘bling’ I adore a lot. Coruscant…definitely a word I will remember. The night sky filled with stars is indeed a magical coruscant wonder. 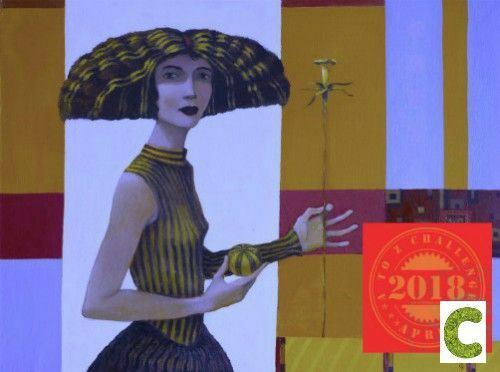 Your lovely words and Sarah’s art are delightful – I’m glad you pointed them out for us. For some reason the your post brought to mind the above. I love that gold which does not glitter, the deep gleam of life, and nature. The deep gleam of life and nature is a beautiful gold indeed. How fun that you mention the Tolkien quote – my husband and I have just begun one of our periodic immersions into the The Lord of the Rings movies. Oh yes Hilary – I think you’ve got the feel for it perfectly! my in’laws retired to the mountains of North carolina … where mica is mined. Their property was sparkling with it. My kids loved collecting it.